You can email us at cnsmsu@gmail.com. All articles ©2014, Capital News Service, Michigan State University School of Journalism. Nonmembers cannot reproduce CNS articles without written permission. EARLY FILE FOR THANKSGIVING WEEK: Well be back on our regular Friday schedule next week. CLEANENERGYSOURCES: Aiming to take advantage of the growing demand for clean energy-related jobs, Alpena Community College is preparing for a new bachelor’s degree program in electrical systems technology. Meanwhile, Lansing Community College is dealing with complications in its alternative energy technology program, including a drop in students because of tougher math requirements. By Jordan Bradley. FOR ALPENA, LANSING CITY PULSE, GRAND RAPIDS BUSINESS JOURNAL & ALL POINTS. 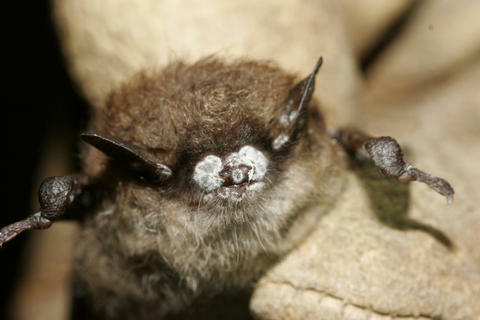 THREATENEDENDANGERED: A fight over logging restrictions is delaying federal protection of the northern long-eared bat, a Great Lakes species that’s vulnerable to white-nose syndrome, a fatal fungal disease first reported in Michigan in April. The forest industry worries that federal listing as threatened or endangered will hinder logging and it prefers state guidelines instead. The Fish & Wildlife Service delayed a decision on the issue until April. We hear from the Bloomfield Hills-based Organization for Bat Conservation, Center for Biological Diversity and Great Lakes Timber Professionals Association. By Kevin Duffy. FOR MARQUETTE, ALPENA, SAULT STE. MARIE, BIG RAPIDS, GREENVILLE, BAY MILLS, CRAWFORD COUNTY, GLADWIN, LUDINGTON, TRAVERSE CITY, PETOSKEY, HOLLAND, STURGIS, THREE RIVERS, CHEBOYGAN & ALL POINTS. w/THREATENEDENDANGEREDPHOTO: Bat infected with white-nose syndrome. Credit: Organization for Bar Conservation. TIMBERJOBS: There’s a shortage of skilled labor for Michigan’s forest products industry, in part because of better-paying opportunities in other fields in the state, such as oil and gas, construction and mining. Gogebic Community College launched a forest technology program and an Onaway-based manufacturer created an industrial arts institute to teach welding. We also hear from the Michigan Association of Timbermen and an Escanaba-area logging company owner. By Eric Freedman. FOR MARQUETTE, SAULT STE. MARIE, BAY MILLS, CADILLAC, ALCONA, ALPENA, GLADWIN, CRAWFORD COUNTY, GRAND RAPIDS BUSINESS, MANISTEE, BIG RAPIDS, CHEBOYGAN, TRAVERSE CITY, PETOSKEY, LAKE COUNTY, HERALD STAR, LUDINGTON & ALL POINTS. LASNING — A team of researchers has developed a way to predict which way smoke will drift away from low-intensity forest fires. Researchers at Michigan State University and the U.S Forest Service developed the system to help fire managers control prescribed fires.